51,000 BTU Infrared Forced Air Space Heater Rental – Val6 Daystar, is available for rent in Rochester NY, Ithaca NY and the entire Western New York region from the Duke Company. 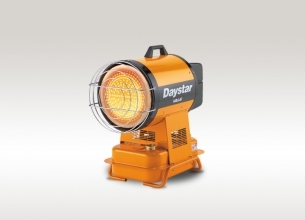 The rental VAL6 Daystar heater generates available for rent, both infrared heat and forced air heat via a dual heating system. The heater’s light weight (40 pounds) and dual heating system results in versatility for the heater to be used both as a spot heater and in open areas. Tank capacity = 2.6 gallons. Safety devices include: photocell flame monitor, 3A fuse, overheat prevention system, tip-over switch. Applications include: heating source in garages, patios, porches, factories, workshops and warehouses.